Ooh, it’s very technical. I’m not sure you’d understand. I’m certain that I don’t. But lack of knowledge, competence and intelligence has not tended to stop me writing about a subject here on Sportive Cyclist. So I’m going to give it a crack. As an esteemed (not to mention gloriously-handsome) Sportive Cyclist reader, I’m sure you’ll have the wherewithall to draw out the relevant lessons for your own training and performance (hint: plan it out in advance; follow the plan; adapt the plan as your circumstances change). For the most part, a pro cyclist’s training is centred around their race objectives for the year. Riders sit down with coaches and team management before the start of the season to identify the races they’ll take part in, and the training that will prepare them. Team leaders and other protected riders (i.e. sprinters and Classics specialists) have the luxury of picking their races and tailoring their training to give them the best chance of winning. Starting with the end goal in mind, winning the Tour de France, Chris Froome and the Team Sky coterie of coaches, work backwards, filling in the training blocks and sessions that will best prepare him to be in peak form during those 23 days in July. Other riders, the domestiques and super-domestiques have to fit their own ambitions around the objectives of the team and the needs of the star riders. Whilst Peter Kennaugh, say, might be on the look out for races where he can shine (he won the 2015 UK road race title, as well as a stage in the Dauphine for instance), his key objective (at least from Sky’s perspective) for the year is to be in peak form for the big stage races where he rides in support of Chris Froome (mainly). The planning principle remains though. The (super)-domestique and their coach works back from the races at which peak performance is required, and fill in the training blocks accordingly. Not all (any?) perfectly-prepared plans produce peerless performance. Race calendars for pro cyclists can, and do, change. This has a knock on for training. Mikel Landa was Sky’s team leader at the 2016 Giro D’Italia, riding for the general classification. Sadly (for him) these ambitions were somewhat thwarted by illness in the first week. One assumes that Landa had trained to peak for the Giro, with the expectation that the hard three week race would take his fitness over the top (three week bike races essentially cause rider’s bodies to eat themselves). He would follow the race with a rest, after which he’d start the process to build again for his next target race. But the stresses he planned to put on his body in May (during the Giro) didn’t happen. He barely made it to a mountain. So his training and racing schedule was re-jigged and he found himself riding in support of Chris Froome at the 2016 Tour de France (although, in fairness, he might have been down to play that role anyway). Historically, many pro cyclists would race themselves into fitness. Partly this was based on the belief that this was the best way to train. It put miles in a cyclists legs. There is no more specific a training environment for a race than a race itself. More so it was a product of pro cycling being a business. If you’re not in the small peloton of riders that stands a chance of leading the GC, come the Champs Elyssee, your main role as a pro was (and is) to wear the sponsor’s name on your jersey and display it prominently, mainly in races. German rider Jan Ulrich (talented, but sadly not as good at doping as Lance Armstrong) famously began each season with a rather large arse. He proved uniformly incapable of restraining himself from overindulging during the off-season. He needed to race in order to give himself the discipline to ride the hard miles and control his eating. This is less common nowadays, where modern communications mean that riders are rarely out of contact with coaches, and off-season training is seen as crucial to in-season success. That said, there are still riders that struggle to stay on the wagon (or off the food wagon) outside of the race bubble (Carlos Betancur, a Columbian rider currently at Movistar is a good example). For every rider that needs the competition of a race to provide discipline to their fitness regime, there are many more nowadays who would consider the race to get in the way of effective training. Races are inherently unpredictable. Weather conditions, or the dynamics of the racing, can make the ride of even a domestique with light team duties a hard one, when perhaps their training programme would ideally call for an easier day. On a shorter, mountainous stage of a multi-day race, if the competition for the GC places kicks off early, the stage can be completed by the day’s winner in such a quick time that the riders in the lowly autobus have to bury themselves just to make the cut-off time for the stage (being a function of the winner’s time). Similarly, driving rain and howling winds can increase the training stresses placed on the riders, even if the racing is not extreme. If I was a betting man, I’d say that Bradley Wiggins’ first day retirement from the 2016 Tour de Yorkshire resulted from the view that riding on in the windyrain would exceed the carefully planned Training Stress Score number he was aiming to achieve on that particular day in his carefully-planned training road to Rio. (Either that or he never planned to ride much of the race anyway – he just needed to show up to make sure Team Wiggins were invited to compete). But pro cycling is a business. Only the very favoured few can take off long months at a time (not winning races, not showing off the sponsors’ logos) to train in virtual isolation ’pon the volcanic slopes of Mount Teide. The majority of riders have to integrate their training programme with the demands of their race duties. Sometimes this will mean that they try to give themselves an easy day in the peloton when they can. In some races, particularly earlier in the season, you see pro riders doing additional training after a stage finishes, presumably because the plan calls for a higher TSS that they’ve not yet met. Not every team leader, or protected rider, aims to win every race that they enter. Or rather, whilst they might like to win every race, they understand that this is not going to happen. Riders that consider themselves in with a chance of winning the General Classification in the Tour de France would be foolish to reach their absolute peak form earlier in the year. They might do a petit peak in the preceding months, but this will be very much as part of the journey to maximum fitness once the Tour hits the Alpes or Pyrenees in the second or third week of July. In Joe Friel parlance, riders will have one or two A races per season (the ones they go all out to win), and a brace of B and C races (the ‘nice to wins’ and training races). There are riders that will target races earlier in the year as their personal ‘A’ races, knowing they’ll ride in support of team leaders at the grand tours later on. In these races, results tend to be in favour of in-form, ‘lesser’ riders, riding their socks off and beating TdF contenders who still might be in a build phase of their training programme. The term ‘specificity’ refers (specifically) to the concept that you create your training plan entirely around the demands of the event you’re training for. It should come as no surprise that pro cyclists do this. The classic example of specificity being crucial to winning a bike race is the need for the winner of the Tour de France to achieve a particular balance of power and weight in order to distance his rivals in the high Alpes (or keep them in reach if he plans to beat them in the time trial). Notwithstanding his current travails, Bradley Wiggins (him again) is a great example of specificity in action (or rather his performances are). In 2012, in order to win the Tour, Wiggins had to lose significant amounts of weight (including superflous muscle) and train for long efforts of climbing, interspersed with bursts of explosive power to chase down rivals (not his strongpoint). Fast forward four years. Wiggins had trained so successfully for the 4km team pursuit on the track in Rio that he rode longer turns on the front than his (world class) team-mates and, certainly in warm up events, was at risk of riding away from them. But he couldn’t ride a long road event at anywhere near a world class level. Many of the most successful professional cyclists (and indeed any successful athlete) train with a level of steely determination that puts us mere mortals to shame. Daley Thompson (renowned pro cyclist – look him up) used to train on Christmas Day, simply because it allowed him to say that none of his rivals had trained more than him when it came to the Olympics. Bradley Wiggins is a cyclist that exudes single-minded determination from every lycra-clad pore (in fact, ‘Singe Minded Determination’ will be the name of the fragrance for men that he releases following retirement). Pro cyclists and their coaches are not afraid to change things in order to eke out additional performance improvement. Gone are the days (mostly) when French pro cyclists would not eat green salad leaves for fear of the untold damage that it would place upon their legs (no, me neither…). Whilst Team Sky Procycling appear to have trademarked the concept of aggregating marginal gains, it’s safe to say that all pro teams (and the cyclists therein) like to make small changes to a performance plan, in order to wring out each drop from the performance towel. (You know, the performance towel). Whilst this isn’t fitness training per se, I recently heard on the Cycling Podcast that Italian multi grand tour winner Vincenzo Nibali changed his diet over this past winter to avoid gaining weight. He wanted to start this year’s training focusing immediately on performance gain, rather than with a side order of fat loss work. Nibali showed that even at 31 and with overall wins in all three Grand Tours, he is prepared to try something new in order to improve his performance. So let’s all train like professional cyclists eh? You know me. I’m all for moving to Girona, getting up early to ride, sleeping in the afternoon, then charred meat and red wine for dinner. Hopefully there is the odd nugget you can draw from this post that will help your own cycling. If you enjoyed this post, please sign up to join my email list. You’ll get an email each time I publish a new post, plus access to a few resources (e-books, pdfs) that are subscriber-only. Click here to find out more. Great post – this is one of your best! Entertaining, informative and inspirational – great job! 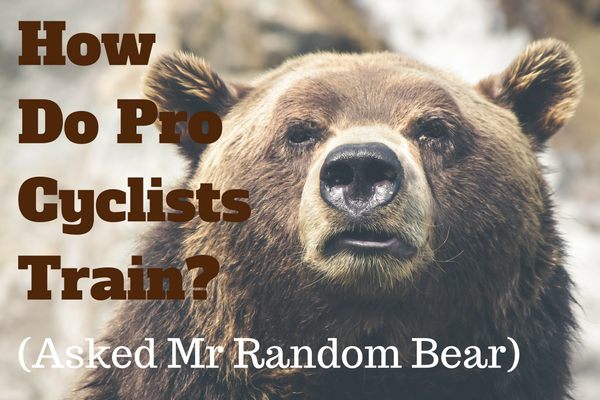 It also sets up your follow up post – How Do Pro Cyclist Train? & how do I ‘build’ my training plan as a mere ‘sportive cyclist’? Or maybe How Do Pro Cyclist Train and What’s it to Me? To help in this direction I’ll supply my meager statistics for this year which beyond training only involve two events – a charity gravel ride and a seacoast century for a total of a little over 1500 miles to date. I didn’t have much of a plan except to ride at least 50 miles a week but didn’t even start that till the weather got nice. I want to more better next year and work on speed as well as endurance but even though inspired am not sure how to proceed. There may be others like me? Then with your expertise and keen cycling sense you can help me ‘build’ my 2017 training schedule which is starting now as it’s getting cooler and currently we are experiencing rain from Hurricane Matthew. Using me as an example you can show all how it should be done! If you like we can have periodic follow ups as to my progress? I’m in complete agreement with Steve. This is quite possibly you’re best post. Seeing as my 2016 “training” was complete sh*t, I am looking toward 2017 with more prepare and a race or two in mind. …and once again, I agree with Steve. A plan here would really help. Nice article, Monty, well-written and entertaining as usual. Pro cyclists — and newcomers to cycling — have the advantage (?) of specific events to train for, but I always wonder about the rest of us, who cycle year-round (or as much as possible): how can we best apply training principles to what we do? How can we best stay at a relatively high level of fitness, even if we never actually peak (and thereby teeter on the brink of overtraining and injury). From an evolutionary perspective, it would seem that this is what our bodies adapted for — hunting big game on the savannas, for example — so I’m always surprised to see this question addressed less, although perhaps the answer is fairly simple, or less lucrative!